Retired English teacher and mystery writer Jessica Fletcher (Angela Lansbury) lives in the quaint coastal town of Cabot Cove, Maine. Whether at home or on a book tour, Jessica often becomes entangled in murder investigations. Though the police are frequently willing to arrest the most likely suspect, Jessica uncovers the true guilty party(s) through her insatiable curiosity and observations. 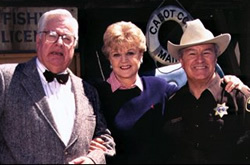 Recurring characters include Sheriff Amos Tupper (Tom Bosley), Dr. Seth Hazlitt (William Windom), Sheriff Mort Metzger (Ron Masak), nephew Grady Fletcher (Michael Horton), private investigator Harry McGraw (Jerry Orbach), British MI6 agent Michael Hagarty (Len Cariou), insurance claims investigator Dennis Stanton (Keith Michell), and private investigator Charlie Garrett (Wayne Rogers). Murder, She Wrote: Could Jessica Fletcher Return? This was a great programme & I’m gonna miss it. I loved the show back in the days, but I have had enough of the reruns.